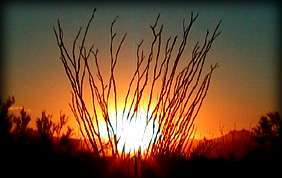 Many visitors and new inhabitants who have lived in the Sonoran Desert for a brief amount of time believe the desert has three seasons: perfect, hot, and hell. When one is accustomed to more dramatic changes from season to season (and cooler weather) this may appear to be true. The Sonoran Desert does indeed have four seasons but the changes are unique and subtle. 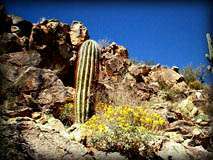 The Sonoran Desert has two rain seasons. In winter, roughly from December to March, occasional and gentle rains move in from the north Pacific. Along the western border of the Sonoran Desert lies high mountain ranges which block the Pacific Ocean storms from permeating the desert with full force. Temperatures can get below freezing in most parts of the desert but usually it heats back up about twenty degrees above freezing during the day. In summer months, July to September, the temperature can exceed 120 degrees Fahrenheit! The only relief from the heat is when Gulf of Mexico brings the monsoon to the desert: sonorous lightening storms and a deluge of rain. Portions of the desert get different amounts of precipitation. The Gulf of Mexico is far enough away that only the remnants of big storms make it to the desert. Even though the storms are not at full power they are able to create a volatile atmosphere. A single monsoon storm can drop more than the annual average in one hour. Common occurrences during these storms are dangerous flash floods that fill dry riverbeds (arroyos) in minutes. Another common occurrence is the ignorant driver who drives their vehicle into a wash believing they may get to the other side only to find they are stuck in the middle of a rushing river. Side note: In 1891, Campo, California received eleven inches of rain in eight minutes. Spring and Autumn are times of drought. These seasons are the "perfect" days; where the skies are blue and the air is cool and breezy. This is prime tourist season when many people come to relax and play in the desert. For us, every season is perfect, unique and always, in all ways a sacred and wonderful nurturing place to live.